The art of stenciling can be traced back a long way. From Egyptian tombs and excavated Roman baths to the Victorian and Early Americana eras. But it truly blossomed during the Arts and Crafts Period, where it appeared on almost every surface you could imagine. So what makes this style of stenciling so different from the painting craze in the seventies? Good question. Artists from this period used designs that emphasized motifs from nature, but the images took on a stylized form and a more simplistic form of nature. Often what turned these simple designs into works of art was the various techniques used to apply them to whatever they adorned. The Arts and Crafts Movement started across the Atlantic Ocean in England around end of the 1800s. 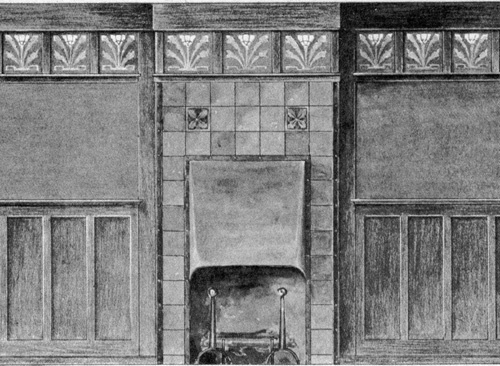 Men like William Morris, John Ruskin and Rennie MacIntosh rebelled against the lack of quality being shown due to mass production and pushed into the public eye their philosophies on hand crafting. As they succeeded, the Movement spread to America. 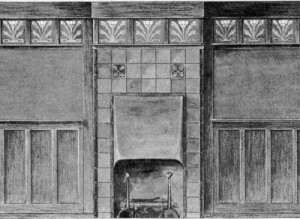 Here, Gustav Stickley, a predominate figure in the progression, began a magazine called the Craftsman, which catapulted the Arts and Crafts Movement into America’s mainstream society. Soon there were furniture makers, potters, coppersmiths and more all promoting wares created by a craftsmanship that was rapidly disappearing. As society moved away from the Victorian era, a new form of housing was increasing in popularity. The quaint little bungalow began springing up all over the country as folks moved away from the large Victorian homes and the servants required to assist them. The extremely efficient bungalow came equipped with built-in furniture, promoted cozy places to gather and seemed to assure families it was an easier way to live, which frankly it was. The Craftsman was just one of many magazines and catalogs that offered floor plans for bungalows and showed ideas for stenciling. One of the Movement’s basic philosophies was to seek peacefulness and pleasure from the environment in which we live. Mother Nature influenced home décor with her colors, the natural beauty of unpainted woodwork and honest simple designs reflecting flora and fauna. For the first time, women were now being encouraged to take part in the decorative arts of their home by not only the Craftsman, but many other women’s magazines such as House Beautiful, Ladies Home Journal and Needlecraft. Mail order kits for stencils and linens offering the stylized Arts and Crafts designs appeared everywhere. With the Movement’s philosophy of returning to nature for inspiration, simplifying one’s life and getting away from the Victorian belief of “More is not enough”, many believed that following these ideals could make one healthier, less stressed and more at peace. 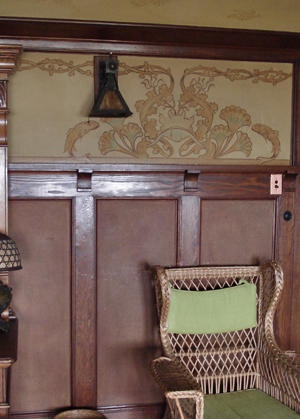 Stenciling was an excellent way for a homeowner to incorporate this into the decorative arts of their household. Still, I had no idea when I stumbled upon the Arts & Crafts Movement just how much stenciling was used during that period. It was used everywhere! Stenciling appeared on all sorts of practical ladies sundries, from aprons and laundry bags to picture frames and pin cushions. Table linens, pillows and curtains were excellent areas to carry a single motif throughout the room creating a simple unity and allowing not just self expression in the chosen design, but in the personalized color scheme as well. And those who were so inclined could then embellish their stenciled textile with various embroidery stitches, using as much as their time or talent allowed. Today, the most common place one thinks of stenciling is still a wall. But even here, Arts and Crafts stenciling took a new approach. Yes, running along the top of the wall close to the ceiling was done, but the Craftsman home, most commonly a bungalow, often had all sorts of wonderful wood moldings to break up the wall and ceiling into perfect palettes for painting. Picture rails created friezes in bedrooms, wood-trimmed panel areas encircled dining and living rooms, and boxed-beam ceilings gave homeowners a variety of areas to stencil. They could even follow wainscoting or tile in a bathroom. It didn’t take long for me to find out just how uneducated the general public was about this vintage period of stenciling. Thankfully, magazines like American Bungalow, Style 1900, Arts & Crafts Homes and Old House Journal were helping folks understand what treasures they had in their beloved little bungalows. Modern craftsman taught people about the beauty of quarter-sawn oak, hammered copper and pottery for these things survived over the years. But how many 1910 houses still bore their original paint? It wasn’t just Arts and Crafts wall stenciling that had been lost, but also buried away was the amount of stenciling that had been used as a decorative art throughout these charming abodes. I had to do something about this. So I started to dig. The more I dug, the more I learned, the more I could pass on. What I discovered along the way was how incredibly unique Arts and Crafts stenciling was. The designs were quite different from the stencils patterns of today. Often working with nature motifs, the simple stylized designs could sometimes be a bit difficult to interpret. The Glasgow Rose is a good example of this stylized design; how many square roses have you seen in a garden? Yet this is a widely used motif from the period. These stylized and often geometric forms of Arts and Crafts stencils gave them a more sophisticated, almost masculine appearance, far from the frilly, scrolling, ribbon–and-bow effects of the Victorian period or the rough and primitive Early Americana style. What also became evident to me were the various techniques used in the stenciling process. Colors were often shaded, giving depth to a single color or blended into another completely different hue. Allowing the colors to blend rather than trying to maintain exact color separation, gave the stencil designs an unusual beauty. More often than not, the oil-based medium was used, although I do occasionally run across original stenciling done in water-based paints. The paint could be applied by a stippling, pouncing, or swirling method. Special stencil brushes with flat tips were the common tool used for the application and today haven’t really varied much from a hundred years ago. The stencils themselves were made from various materials. Metals, like brass and tin or more flexible material like canvas and leather. The most common material was a stiff, heavy paper stock that had been oiled or varnished to protect it. 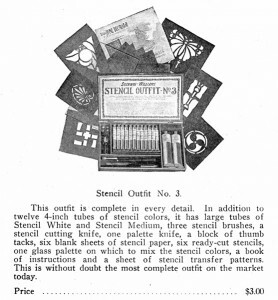 These paper stencils would have been the most likely type of stencil that the Arts and Crafts homeowner would have acquired and used. They were available through a variety of mail order catalogs, often distributed by companies that sold paint supplies as well. For a mere 20 cents or so, one could buy a stencil, have it delivered directly and soon be ready to create the home of their dreams! The most exquisite of all Arts and Crafts stencils was the Outline Stencil. Here, only a dashed outline of the design was applied in stencil form. Then, using oil based glazes and a variety of techniques and tools, the stenciler would paint in the design, as if filling in the lines of a coloring book. Sometimes the glazes were wiped out with fingers or cloths to create highlights in the design. These fabulous stencils were not for a novice, but applied by professional decorative painters at the time. 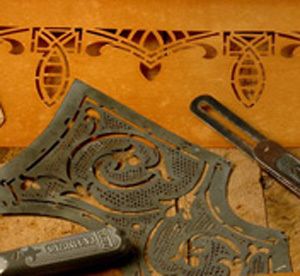 Stenciling an Arts and Crafts design today is really similar to stenciling back then. Fortunately, the differences seen today are for the better. Now, most stencils are cut from a material that is far easier to work with and much more durable. Paints today are much less lethal than their ancestors and more consistent in application. With our hectic and complicated lifestyles, incorporating the soothing effects of nature into one’s environment should be as popular today as it was back in the Arts and Crafts Movement. A recent fortune cookie I opened read, “The philosophy of one century becomes the common sense of the next”. It makes common sense to me to return to the beauty and tranquility of Arts and Crafts Stenciling.